Low polygon ford focus racing car. This version has trademarked symbols edited out. 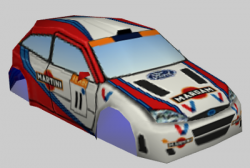 qudubup mentioned that the trademarked logos (martini etc) could be an issue, so if you want to be extra careful edit these out of the skin before using the model. Edit: this version is now without the logos!